Tails and the pie XD. 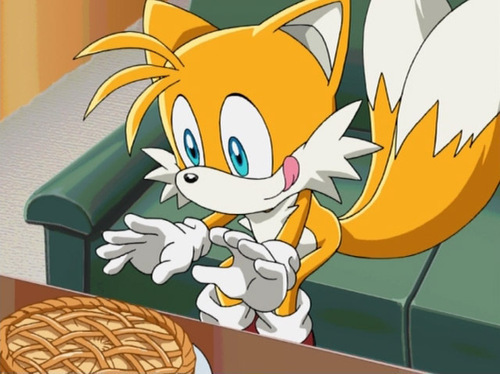 Tails likes pie XD. Wallpaper and background images in the Miles "Tails" Prower club tagged: tails. lol that could be a Thanksgiving pic! That's my 2 fav things: Tails, and PIE!!!!!! I don't know what I want more! Tails, or the PIE!!! Listen Tails. We've been over the this. Hand over the pie and no-one gets hurt. TAILS! IT'S MY PIE! GIVE IT TO ME! HEY!DON'T FIGHT WITH HIM-TAILS GIVE THE PIE TO ME IT'S MY PIE!I'll be your girlfriend!. TAKE THE PIE TAILS, TAKE IT!!! NO!!!!! IT'S MY PIE! GIMME IT!!!!!!!! NO IT'S MINE,Tails who do u agree..with...me...the beautiful-girl,Or Taismo723? enjoy the pie little one! tails has one big pie dig in!!! if tails finds the pie first then u guys get to watch him eat the pie IT'S, ALL FOR TAILS!!! (me) I walk over to Tails and sit on the couch. "My goodness, I guess I'm not the only fan of pie around here." Tails looks up to me. "Can I have a slice?" "sure ya can. I'm gonna make another one anyway." Amy took it away from me. ME AND SONIC COULD'VE JUST SHARED!!! Hey, Tails, can I have some please? YOU'RE NOT GETTING HIS PIE!!!!!!!!!!!!!!!!!!!!!!!! YOU'RE NOT GETTING HIS PIE!!!!!!!!!!!!!!!!!!!!!!!!!!!!!! Tails: Im gonna eat the whole thing! Haha mariofan14 I had the same idea! And nobody takes Tails' pie! I got his back ! Tails:I want MOAR because i eat that pie in 0,000001 Sec.!!! Tails must use The Force to get the pie!